Disclosure: Runtal gave me a discount on the retail price of this baseboard heater. Last summer, the impetus for my office remodel was to make it warmer in the winter. My office is in basement — it’s a walk-out basement — and my office is on the corner, two walls to the outside. In the winter, the space was cold enough to require my running one of those little space heaters all the time. And then, it still was chilly. 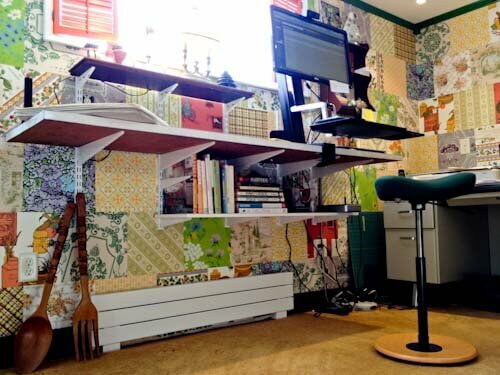 Since I now work at home full-time, I decided to invest in comfort — and yes, it was super fun to decorate the walls with nearly 300 pieces of vintage wallpaper, all Holly Hobby on hallucinogenics-style. The two key steps we took to improve the comfort level in the room: (1) we built out more studs and put in a double layer of insulation on the outside walls and (2) installed this 4′ long Runtal electric baseboard heater under the window. Six months later — and well into a freezing cold winter — how is it all working out? Gold sparkle kitchen counter top: All mine after years of searching! On Saturday, I went trolling around for treasures. I stopped at the new Re-Store in Pittsfield. Usual story: I found a light for $10, a 4-switch vintage wallplate for 25 cents, and just as I was about wrap it up, I spotted the real treasure: 80 inches of gold sparkle laminate, kind of hidden under a pile of wall cabinets among a used kitchen cabinet set. Happy dance. It’s in excellent shape, barely needs a cleaning. It’s 20″ deep — perfect for what I have in mind for the window wall in my office remodel. It cost just $8, and it even fit in the car once we put the seats down, no return trip with the Ranger required. Next: I’m dropping a sink right into that 18″ deep shelf. Yes, it takes “forever” to finish all the details in a room design project. 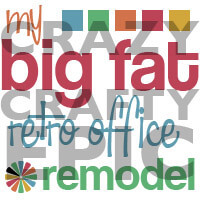 As you will recall, step #1 in my retro crafty office remodel was to get the room gutted, add insulation, add recessed shelving, put on new drywall. 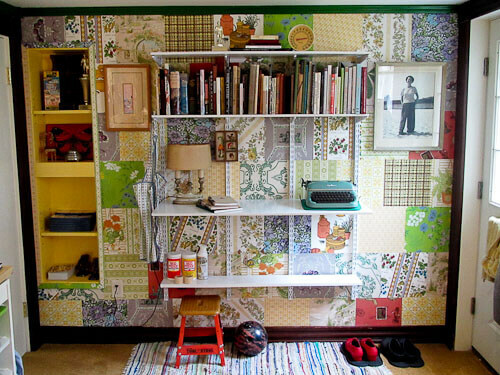 Step #2 was for me and Denise to make a patchwork quilt of 18 different kinds of wallpapers, on all four walls. 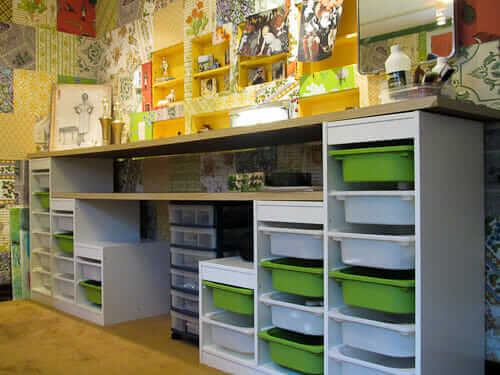 Once all the foundations of the room were in place, I could then proceed to follow up projects — the furniture, storage and decor. Followup project #1, I decided on and installed my crafting storage area using children’s storage and a salvaged countertop. Now I have completed followup project #2: Installing modular storage along the wall by the doors.As you can see, I was influenced by my recent story on the history of Knape & Vogt shelving — the original (1938) patented modular storage system — and that’s what I installed. Read on for more details about why I chose the KV, along with tips from my DIY experience installing this shelving.